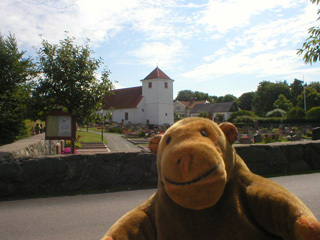 "A very pleasant walk, I think"
Mr Monkey trotted up the road towards Tången, going inland and uphill. At a junction, he found this attractive little church, as well as a local folklore museum, which was shut. 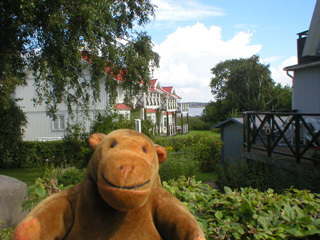 After a bit of wriggling the road started going downhill again, and soon Mr Monkey was able to see the sea again, between the houses of Tången.